was seriously injured during an abortion on April 1, 2017. Toledo, OH – The Ohio Department of Health (ODH) is seeking to impose a fine of $40,000 against Capital Care Network, an abortion facility in Toledo, Ohio, after a complaint inspection found five “serious licensure violations” related to a mishandled abortion-related medical emergency on April 1, 2017, according to documents obtained by Operation Rescue. This fine is particularly significant since the Capital Care Network is expected to argue before the Ohio Supreme Court tomorrow that hospital transfer agreements are unnecessary and place an “undue burden” on women seeking abortions. “These documents, along with photographs and eye-witness accounts, actually demonstrate an urgent need for enforcement of the hospital transfer agreement provision. It is critical to the safety of women that the state immediately shut down Capital Care Network for their deceptive and dangerous practices that endangered the life of their patient then tried to cover it up,” said Operation Rescue President Troy Newman. 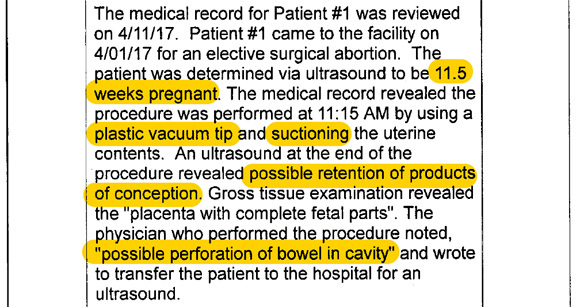 One day after Operation Rescue published a report and video detailing how the abortion emergency was mishandled, it received documents from the ODH in response to a four-month old public records request that supported Operation Rescue’s account of that incident and shed further light on the nature of the patient emergency and the callous attitude of the abortion business staff toward their critically injured patient. According to a letter from ODH Director Lance Himes and an attached inspection report, on April 11, 2017, ODH representatives inspected the Capital Care in response to a complaint submitted on Operation Rescue’s recommendation by a pro-life activist who witnessed the April 1 incident. Those inspectors reviewed the chart for “Patient 1” and interviewed staff members, including “Staff A,” a “patient advocate” who drove Patient A and her “significant other” to the Toledo Hospital emergency room in her private vehicle and dropped them off before returning to work. In order for a bowel to be perforated by a plastic vacuum tip during an abortion, it would require the uterus to be perforated first. The combined uterine and bowel perforations are life-threatening injuries. Capital Care Network failed to send the patient’s medical records to the hospital with her, according to the inspection report. That left emergency room personnel in the dark about the patient’s treatment and condition, thus disrupting the continuity of care requirement that applies to all medical professionals. This likely delayed emergency care to the seriously injured patient. 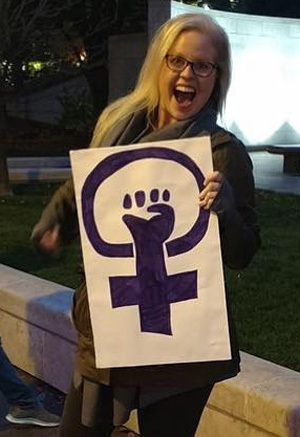 Capital Care Network employee Schuyler Beckwith, displaying a radical leftist “anarchist feminism” sign. Beckwith was asked by inspectors why emergency policies that required staff to call an ambulance for hospital transport were not followed. An eye-witness told Operation Rescue that an African-American woman was brought out the back entrance of the abortion facility and loaded into Beckwith’s Ford Focus during the April 1 incident. The woman was doubled over in pain and walked only with assistance. Another eyewitness saw Beckwith drop off the woman and her companion at the Toledo Hospital emergency room entrance before driving back to the abortion facility. •	Failure to provide the patient with discharge instructions upon leaving the facility. Capital Care Network attorneys requested a hearing on the $40,000 fine in a faxed letter to the ODH dated September 7, 2017. They are also set to appear before the Ohio Supreme Court on September 12, at 9 a.m. for oral arguments in the state’s attempt to enforce licensing requirements, including the hospital transfer agreement provision, that Capital Care Network cannot meet. If successful, Capital Care Network would be forced to close. Read the Letter of Intent to Fine and the inspection report. Read Operation Rescue’s original report on the April 1 mishandled medical emergency.